LOS ANGELES — The nation’s homeless population increased this year for the first time since 2010, driven by a surge in the number of people living on the streets in Los Angeles and other West Coast cities. “A lot of people in America don’t realize they might be two checks, three checks, four checks away from being homeless,” said Thomas Butler Jr., who stays in a tent in downtown Los Angeles. City officials, homeless advocates and those living on the streets point to a main culprit: the region’s booming economy. Mulvihill reported from Cherry Hill, New Jersey. AP videographer Krysta Fauria and photographer Jae Hong in Los Angeles contributed to this article. Is the ‘creative class’ saving our cities, or making them impossible to live in? 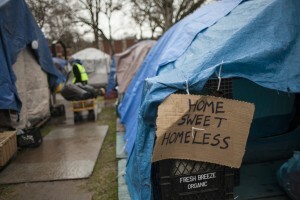 The housing shortage and homelessness in San Francisco. Is there a solution?